As the highly sensitive mom of several highly sensitive kids, I find homeschooling intense, and so do they. Do you remember what it was like in school when the teacher would call on you? When you had to do something at the blackboard? That feeling of being “ON” and being watched, the anxiety of not wanting to be wrong — these can be very intense for our highly sensitive kids. Homeschooling can feel like you are being called on in class 100 times a day. By the person you want most to accept and love you, your mom. So getting papers graded by your mom can be painful. “Look at all these stupid mistakes you made,” they proclaim. A few mistakes (or even many) on a paper are not a sign of intelligence or worth, but kids can see them as such — especially if mom gets exasperated, or they have learning disabilities which make mistakes more common even though they “know” the material. I’ve found a way around the whole mess. I very rarely grade anything. one, are they just careless mistakes, like a child who makes an arithmetic error in a larger problem, but “gets” the math behind it all? two, does the child not understand the main idea or concept or simply doesn’t know the fact you are asking? For the number twos, I reteach. I try not to come at it saying, “you’re really struggling with the concept so here it is again.” I look for fun ways to relearn things – songs, chants, videos, historical fiction books, games. Yes, even for bigger kids. I may not come back to it right away. A short break has often been the perfect thing to let something sink in. The younger the child, the more time they have to be exposed to things over and over. They probably won’t go to college thinking that George Jefferson was the first president, like they wrote on their 3rd grade paper. 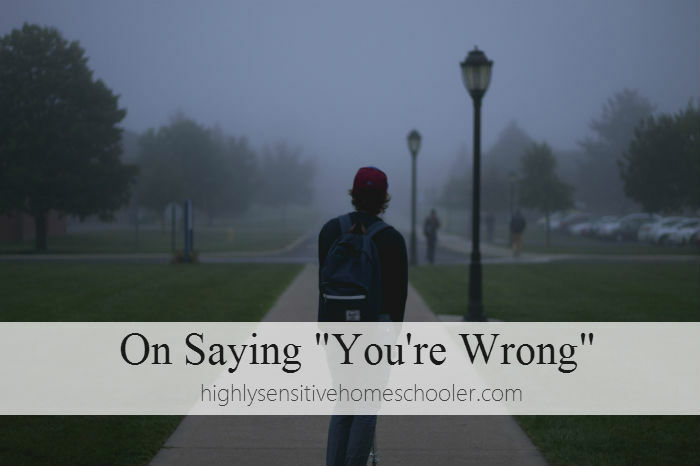 It may take a little more thought and time, but my sensitive all my kids really appreciate NOT being told they are wrong all the time, and are developing into children who enjoy learning. How do you handle grading in your homeschool?